Let mummy know she's the pick of the bunch! 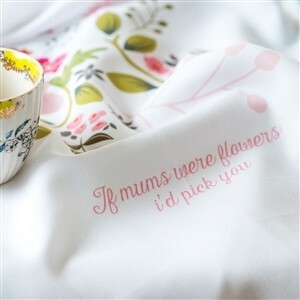 This printed tea towel is a super sweet gift for Mum on Mother's day. With a gorgeous, colourful floral design printed across the centre of the tea towel with the sweetest little message at the bottom. The message reads: 'If mums were flowers i'd pick you'. As a little something extra we will pop in our adorable Mummy mini card which we think goes oh so perfectly with our floral range! Made from polyester in a lovely cotton feel.Heat pressing simply means that dye is pressed directly into the fabric, as opposed to a vinyl overlay which has a tendency to peel off over time. With heat pressing the dye is integrated into the fabric producing a durable tea towel which is machine washable.